60 Months Lease with 10% Cap Reduction, for $1798 a month + Tax O.A.C. Own this CARFAX Buyback Guarantee Qualified Huracan today, worry free! 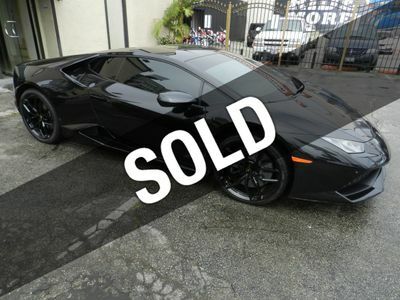 At just 10921 miles, this 2015 Lamborghini provides great value. This Lamborghini Huracan also includes Power Driver's Seat, Clock, Climate Control, Power Passenger Seat, Tachometer, Dual Zone Climate Control, Power Steering, Telescoping Steering Wheel, Power Windows, Power Mirrors, Lthr. Steering Wheel, Driver Airbag, Passenger Airbag, Intermittent Wipers, Side Airbags, Keyless Entry, Security System, AM/FM, CD Player, Separate Tweeters, Sport Seats, Remote Fuel Door, Remote Trunk Lid, Vanity Mirrors, Heated Mirrors, Daytime Running Lights, Roll Stability Control, Tire Pressure Monitor, Carpeted Floor Mats, Aux. Audio Input.